"MADE IN HONGKONG is dealing with electronic storage systems "Made in Hongkong" and the design and production of objects such as plates, cutlery, radio-receivers etc." (Joachim Baur and Josef Klammer, project description). Two key-issues of the entire project were the concept of "modelling" and the concept "work". The radio broadcast "MADE IN HONGKONG - part 1" - in itself a model of a prerecorded radio-broadcast with live-interventions, took place while Josef Klammer and Joachim Baur were travelling on board a Lufthansa flight to Hongkong. 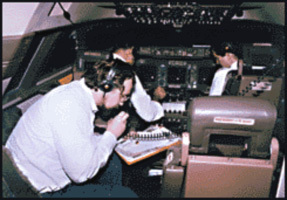 The two artists had succeeded in getting access to the radio-contacts of the plane's pilots and thus were able to report live from the cockpit - in collaboration with the pilot, who himself enjoyed the opportunity of broadcasting live on the Austrian National Radio, announcing and describing details about his flight. The live connection between the cockpit of the LH flight to Hongkong was established via radio to Stockholm and from there via telephone to the radio-studio in Vienna. "In this moment, we move through our own broadcast. We fly through the radio-waves which we are transmitting ourselves....We find ourselves right in the center of our own wave range. We are sender and receiver at the same time. We experience the state of identity with our own piece. We ourselves are part of our electro-magnetic art-work." (J.Baur and J.Klammer from the plane). samples from songs (many musical genres) dealing with sky, stars, earth, flying..
excerpts from a song by a Cantonese worker, singing onto a chip to test its qualification to be built into answering machines, speaking dolls etc. samples from the gold-covered image-sound-disks carried by Voyager I and II into orbit. These disks not only carry 118 fotografs, but also 90 minutes of "the most important music" produced by mankind as well as an audio-essay of sounds of our planet and messages in 60 different languages and in one world-language. The Real Audio File of the broadcast so far only contains the prerecorded version of "MADE IN HONGKONG part 1". Kunstradio was not able to locate the recording - of the well remembered - live interventions from the airplane. Josef Klammer und Joachim Baur auf dem Flug mit einer Lufthansa-Maschine nach Hongkong. Sie berichten aus dem Cockpit, zusammen mit dem Piloten, der den Zeitrahmen durch die Angaben der jeweiligen Flugposition unterstützt. Die zweite Ebene besteht aus Aufnahmen aus Hongkong: der Speicherinhalt kleiner elektronischer Bauteile wurde zu Testzwecken von Arbeiterinnen besungen und besprochen und diente so als akustische Anthologie für diese diversen Gegenstände. Das betrifft in diesem Fall den "Inhalt" von Radiogeräten und eignete sich damit zum "Inhalt" für diese Radiosendung. Josef Klammer und Joachim Baur wählten HONGKONG als "Zielort" weil es ein brennender Ort im ostasiatischen Raum ist, der über das Maß als "Chiperzeuger" hinaus auf eine politische Raum-Zeit-Dichte verweist. - Der "Spielraum" ist in den täglich verwendeten Dingen handlicher Größe.